As Tozeur is a little bit shorter trip for most travellers, Nefta gets far less visitors than its neighbour city. Apart from that, the two settlements offer much the same: The same architecture and oases of about the same size. But there are things that keep Nefta distinct from Tozeur. 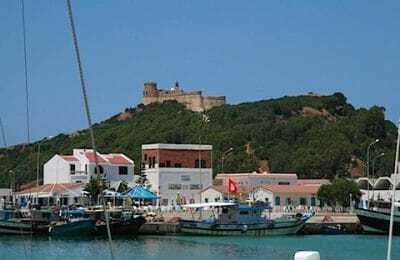 According to a local myth, Nefta was founded by a Kostel, grandson of Noah. After the Flood, he went to Nefta to settle when he discovered that this was the first place on earth were water boiled. No surprise then that Nefta is an important religious town, both in people’s minds and with its many holy buildings. The main religious movement in Nefta is Sufism, which often is labelled as a mystical orientation mainly within Sunni Islam. The bathing pool at the beginning of the Corbeille. Note the gully cutting Nefta in two parts, gives the the town a dramatic setting. It is about 40 metres deep, and widens up to a maximum of 300 metres, before it narrows down to 20 metres before ending up in the oasis proper. The corbeille seems to have inspired many pious men throuh the centuries and many white tombs (zawiyyas) have been put up next to it. 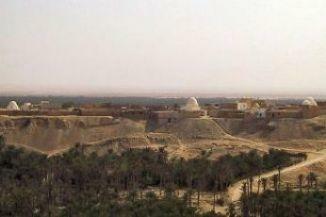 Nefta has a status of holy city and a centre of Sufism (mystical subgroup in Islam). In the northern end of the gully a pool has been built next to the hot spring, and serves as a bathing pool for both sexes with free entrance. Walking down the Corbeille couldn’t be easier; there is one track leading down between the gardens. If you follow it all the way, it will lead you down to the oasis proper. El Bayadha is the district of most religious buildings in Nefta. Most of them are zawiyyas, tombs for sacred men. Some zawiyyas also serve as mosques, and they are always places of special powers. 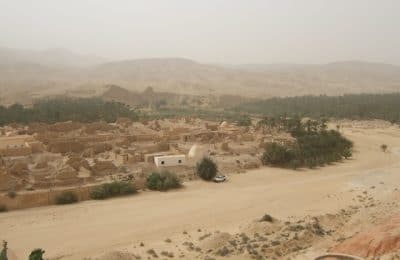 It must be location of El Bayadha which has made this the most sacred area in Nefta: Overlooking the sources of the oasis and beginning of its gardens in the Corbeille, it must have been an even more miraculous place in the past than it is now. The mosque of Sidi Salem is usually labelled great mosque, but has no special functions from the other mosques. It is simply larger. Its appearance is simple, dramatic and beautiful. Simplicity has been performed to its completeness here, and even the inner parts are as unadorned as the exterior. Note, however, the unusual holes in the dome on its eastern side. 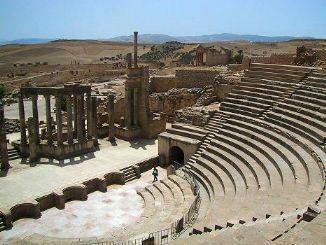 The area with the best preserved traditional houses is Ouled Ech Cherif, in the southeastern part of Nefta. It cannot really stand up to the traditional quarters of Tozeur, but some places there are still some very nice houses with elaborate brick patterns. The overall style here is far simpler than that of Tozeur, although the same type of bricks have been used here. A common explanation to this is that the everyday house should not challenge the beauty of the religious houses, and Nefta has always been a more religious-oriented place than Tozeur. To a larger extent than with Tozuer, white colour has been used, usually painted over the bricks. Another thing that is different is that doors here are far less decorated. There is a private museum a bit to the south, called Dar Houidi, where you will have a chance to look inside one of the wealthier homes. It is unfortunately overpriced at 3TD. Ez Zaouia quarter has suffered hardest from the 1990 floods, but is still worth the visit for its nice views over the Corbeille and over to El Bayadha. The only interesting building that survived the floods is the Sidi Mohammed Bel Hajj (upper photo). One of the smaller marabouts of Nefta. The oasis is made up of 300,000 date palms, where 70,000 are deglets, date palms of supreme quality. Water comes from 150 springs, and the setting is picturesque with all the narrow roads running through the groves, and is a perfect place for seeking refuge from the sun, if you make your visit during the summer. Since the 1960′s, the oasis has been irrigated atificially. Expansion programs involved drilling of wells, which then reduced pressure from the underground reservoirs, and drying out of the springs. So then, even more wells had to be constructed. Finding a room of your liking represents no problem in Nefta. The town has both budget, middle and high class. Value for money is good all over. You do, however, pay quite a bit extra if you go for a room with a view over the Corbeille. In my view, it is only the Sahara Palace which has rooms worth extra money. But that is also by far the most expensive place in town, and reputedly the worst service. Bel Horizon, nearby, is a good alternative, far cheaper, still very nice and with friendly staff. Good selection of restaurants, both independent and in hotels. All classes and price levels. Not too much. If you want to do something more sophisticated than drinking your beer in an empty bar, you will have to go to one of the hotels overlooking the Corbeille. 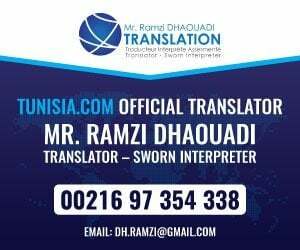 Direct bus connections with Tunis, for other destinations, travellers should go to Tozeur by bus or taxi (25 minutes).